I am a typical girl. ….Or at least I used to be. Until very recently, I would walk into my closet stuffed so full of clothes you couldn’t slip one more hanger in there, and declare I had nothing to wear. First of all, admitting that makes me disgusted with myself after being in Thailand and seeing people who actually have nothing to wear. Secondly, I started reading the book The Life-Changing Magic of Tidying Up and I was completely inspired to create a minimalist wardrobe. If you haven’t read the book, she basically instructs you to hold each piece of clothing and ask yourself if it sparks joy. It sounds a little wack – I get it. But the incredible thing is that IT WORKS! Really, it does. I threw away old clothes. I donated a trunk full. And I kept only the things I love. If I liked it but it didn’t fit quite right? Gone. If I loved it at one time but it no longer fits my taste? Gone. If it was something I felt obligated to keep only because I paid too much for it or it as a gift? Gone. Can I just tell you how much freedom this ONE LITTLE THING gave me? Instant reward. Instant relief. Paring down my wardrobe was honestly the catalyst of my simplify journey. Now I know better what works for my life, my body type, and my taste. So I’m not quick to pick up that shirt on the clearance rack only because it’s $6. My criteria has changed and my standards have increased. 1) Do I LOVE it? If it’s only “okay” or I’m only buying it because it’s on sale, there is a good chance I will like it even less once I hang it in my closet. 2) Does the cost per wear ratio make sense? Shoes, jeans, and outerwear/cardigans get so much use in my closet so I am willing to spend a little more in these areas to get good quality pieces that will stand up to the wear. 3) Does it fit in a category that I know works well for my body type? I have heard many people discuss the advantages of having a “uniform” that you can always rely on, and now I’m a believer. Not in a structured, boring way, but in an I-know-this-works-for-me way. I really love cardigans, kimonos, and ponchos that can layer and provide some extra angles and depth for my smaller frame. So those are a go-to for me. *I say “usually” because of course, there are exceptions. Sometimes I just need a new pair of yoga pants or socks. These don’t require the grilling my other wardrobe items do! Giant BONUS to this simplified wardrobe? My morning routine is quicker and less stressful because everything in my closet WORKS. I don’t have to change eight times before I’m happy with the result. 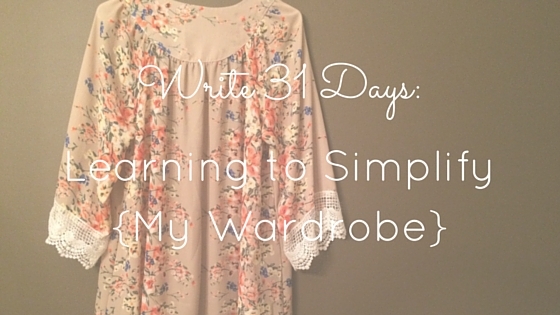 I really believe a wardrobe is the perfect starting space in learning to simplify. Everyone can clean out their closet, and since there are such immediate benefits, I think you’ll find the motivation to start simplifying other areas of your life as well. Join me tomorrow as we cover another topic in learning to simplify! And as always, thanks for reading. Previous Article 31 Days of Learning to Simplify: But why?